I’m home!!! Well, not at this minute I’m not. I’m sitting in the car with my knitting. I’m watching Frankie and a friend. 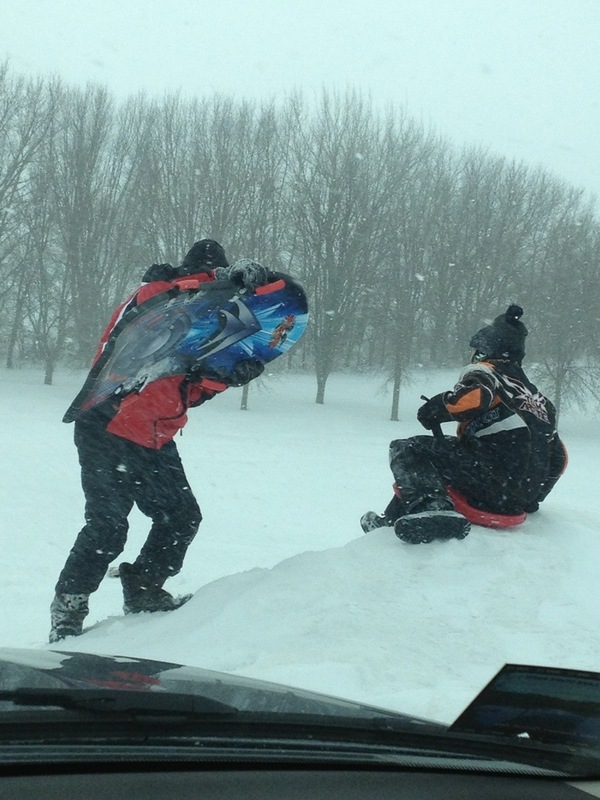 They’re having a blast sledding. We ended up with another snow day. We got about 4 inches of snow and lots of wind. Perfect for knitting! Re entry from my lazy life with The Genius has been a bit rough. We had rain and ice last week so we have two roof leaks. I don’t mind laundry, so that’s not a big deal. I’m being creative with dinner tonight so I don’t have to go to the grocery store. Vegetables aren’t a necessity. Are they? Categories: Uncategorized | Tags: knitting, Sledding, snowstorm | Permalink. We grilled on Saturday night. My Hero still had to walk over a bunch of snow to get there, but that grilled steak was wonderful. As you can see, I’m playing with spring yarn. I have Handmaiden Sea Silk in two colors. I’m studying a bunch of patterns. I think the topaz is going to be the LOVe Shawlette. I’m not sure about the Berry yet. I love spring! I’m pretty sure my reality check bounced. Here’s what it’s like around here in reality! We got at least a foot of snow in the last 24 hours and it’s still snowing. Dreamboy, on the other hand, is not so thrilled right now. We have a circle driveway and the snow was still piled high on both sides. He’s now resorted to piling it in the middle of the circle. It’s great having a kid old enough to run a skid loader, because it takes at least two hours every time we get dumped on. He’ll be happy in another hour when he heads out on the snowmobile! I’m going to go wind that sea silk. Categories: Uncategorized | Tags: Handmaiden, Sea Silk, snowmobiling, snowstorm, spring | Permalink.